Want More? 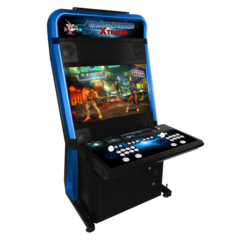 Arcooda's new Game Wizard Xtreme arcade machine offers a plug and play solution for XBOX 360, XBOX One, Playstation 3, Playstation 4, PC/Computer and Arcade games in a dedicated 32 inch arcade machine. Please note this is not a coin operated console machine, however is coin operated for arcade game boards. The Game Wizard Xtreme is a full commercial grade arcade machine and is the first product to combine the home console gaming and arcade experience in the one "plug and play" machine.The Game Wizard Xtreme Arcade Machine has full steel construction, premium quality Sanwa Joysticks and Pushbuttons and a 32inch High Definition LCD commercial grade Monitor. This arcade machine is suitable for home gaming or in locations where you are offering game play for free. Effortlessly play the latest console games on your XBOX 360, XBOX One, Playstation 3, Playstation 4, computer, and arcade JAMMA and JVS game boards on this arcade machine. For more information please contact us. For coin operated XBOX 360 operation, Gate Gate VU is still your best option.